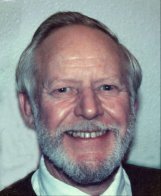 He was born William Stewart Gibson, the middle of three children, on 28th January 1933. in Wallasey He was evacuated to Wales during the war, attended Wallasey Grammar School, and gained a scholarship to Brasenose College, Oxford, where he gained a degree in Chemistry and a Doctorate in Metallurgy. He went on to work on testing metal for construction of Trawsfynydd Nuclear Power Station. He had a lifelong interest in music, and as a boy regularly playing the organ for services at the Church of Christ in Wallasey. He was keen on outdoor activities, including hiking in Snowdonia, and motor biking round Europe. At a hostel where his friend was warden, he met Pearl (already a ringer) who was a temporary assistant warden, and they were soon engaged, and married at St Nicholas’ North Stoneham. They moved to Maidenhead, where Stewart learned to ring, and he never looked back. They had three children, and in the 1970s moved to Northumberland, where Stewart was a research metallurgist with Wilkinson Sword. They took up family camping, and also had their first dog, a Sheltie called Sheba. From then on Shelties played a large part in Stewart’s home life. In 1978, he became Quality Control Manager for Hydron, a contact lens manufacturer in Farnborough, and the family moved to Wokingham (which had two rings of bells) where they remained until after Stewart retired. In 1999, he and Pearl moved to the village of Fladbury in Worcestershire (also with bells). Stewart found a great community of friends there, and involved himself in all aspects of the Church, bell ringing, the local community, and Sheltie Agility Training. He was singing in a rehearsal for a concert when he collapsed. The above is a precis of his non-ringing life. Over 150 people, including many ringers, were at his memorial service in Fladbury, and heard the following tribute to him as a ringer. I met Stewart when he moved to Wokingham in 1978 and joined the ringers at All Saints, but his ringing career began long before then. Shortly after gaining his Doctorate at Oxford, he met Pearl who was already a ringer, and he learned to ring at Boyne Hill, Maidenhead, taught by George Gibbs. He rapidly developed into a competent ringer, and rang his first quarter peal in summer 1961. His first peal was not long afterwards, possibly at Burnham, but no one is sure, because Stewart kept no records. He served as Tower Captain at Maidenhead for two years before moving to Northumberland. At Morpeth there were bells in the Clock Tower, but there was no band of ringers. For a long time, the only regular use of the bells had been chiming for occasional civic events, and to sound the curfew. That was clearly far from ideal, so Stewart and Pearl set about establishing regular ringing, possibly the first change ringing band since the bells were installed in 1706. Training a new band from scratch in an isolated tower is no easy task, but Stewart had a talent for teaching. One of his former pupils told me how grateful she was that he taught her to handle a bell so well, since it helped her to continue with her ringing when other things were difficult. Stewart was Tower Captain until he left in 1978. By that time Morpeth had rung 5 quarter peals and a peal, all rung to mark local civic or national events, and the band had come 2nd in the striking contest at Hexham in 1977. Stewart’s persistence also led to the restoration of the town’s handbells. The Borough Council had ‘limitations upon expenditure’, but Stewart didn’t take No for an answer, and two years later, a suitably large cheque appeared, enabling the restored bells to ring ‘The Old Hundredth’ for the centenary that year of the Durham & Newcastle Association of Church Bellringers in Durham Cathedral. Stewart arrived in Wokingham at a time of great change for the band at All Saints. Over a few short years, the arrival of many experienced ringers, and an upsurge in training new ringers, transformed the band. Stewart helped to mould the collective values and aspirations of what was in many ways, another new band. Over the next twenty two years, Stewart played a full and active part in the life of Wokingham ringing. He served as Tower Foreman in 1983, and again from 1993-94. He was also Deputy Foreman for a total of four years, and Secretary for a year. The only office he didn’t hold was that of Steeple Keeper (which for the benefit of non-ringers is the person who maintains the bells and fittings). At Wokingham, Stewart rang 215 quarter peals. Many of them were for services, and Stewart was one of the band’s most regular and reliable service ringers. He rang 15 peals in Wokingham, out of a total probably between 20 and 30. He rang in the first peal of Wokingham Surprise Major, which was rung for the church’s 800th anniversary in 1990, and his name thus appears on the only modern peal board in the tower. He was a regular member of the All Saints striking competition teams, and he appears in a picture on the tower website, taken after winning the Oxford Guild 8-bell contest at Bicester in 1986, at the height of the team’s success. He contributed in many small ways too. For example, it was at his suggestion in 1981 that the ringers’ annual ringing of carols around the town at Christmas was turned into an all year round tune ringing group, mainly consisting of enthusiastic youngsters. The group still exists, but its members are no longer youthful. Stewart made a significant contribution to ringing outside his home tower. In Sonning Deanery he was in succession, Deputy Ringing Master, Vice Chairman, and Chairman. After that, he and Pearl represented the Deanery in the Oxford Diocesan Guild General Committee. He was an active member of the Open University Society of Change Ringers, serving on its committee for 8 years, editing its newsletter, and organising many ringing days. He rang three peals for them. When Stewart and Pearl moved to Fladbury, Wokingham’s loss was Worcestershire’s gain. Stewart had retired from work, but obviously had no intention of retiring from ringing. He was a regular at District practices, and many of the quarter peals he rang included people ringing their first. His teaching instincts were not lost, and when standing behind learners he had the knack of getting just the right balance of compliment and constructive criticism. He served as peal Secretary of the Worcester & Districts Change Ringing Association from 2002 until his death. The role suited him – he was a stickler for detail, and could always be relied on to provide information when required. It is ironic that he modestly kept no personal ringing records. I spoke to Stewart last summer, when I was collecting biographical details for a book on the history of ringing in Wokingham. Little did I realise that so soon I would be reusing the information that he gave me for this tribute. Stewart left an imprint on ringing in many places, and many will ring in his memory. Last Sunday we rang a quarter peal at Wokingham. And as I speak, the bells at Morpeth have been ringing another quarter peal in Stewart’s memory, which started at the same time as this service. I’ve told you the facts of Stewart’s ringing life as I know them, but bare facts can never adequately describe someone you have grown to know over many years. Stewart was a modest man. He didn’t push himself forward, but he was always willing to give advice when needed, he was always willing to help when asked, and he played a full part in the life of the ringing communities of which he was part. He had a clear, rational approach to things, and a wry sense of humour. He was much liked by those who knew him, and who rang with him, and he will be warmly remembered by all his ringing friends.